Now The Details: Two Cheers for the Analog Culture. Or Why You Still Need a Pencil! Two Cheers for the Analog Culture. Or Why You Still Need a Pencil! For about 15 months in the early 1970s, I spent five days a week in the National Library of France, the Bibliothèque Nationale. I was researching a thesis and many of the original documents and pamphlets I needed were kept in this magnificent building, designed by Henri Labrouste (1862-1868). The building has recently been restored and the windows cleaned. The bucolic arches (seen here on the left) were invisible to me, covered as they were with about a century's worth of Parisian grime and intellectual sweat. The lighting was also particularly dim, with one 40 watt bulb per table, providing shared "illumination" for four researchers. One crabbed old scholar, working on his "Doctorat d'Etat," (a 30 year process) would yell at anyone who sat down at his shared table and who dared to turn on the light. "Monsieur," he would yell. "The electric light, it is not good for the eyes." And he would turn the light off, leaving the others (sometimes me) sitting at his table in the dark. I was reminded of this remarkable, if somewhat solitary period of my life by an article in the New York Review of Books of January 9, 2014. 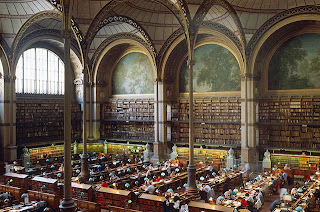 It's a review of a book by Arlette Farge, entitled "The Allure of the Archives," and the reviewer is the renowned French historian, Robert Darnton of Harvard University. The review evokes the pleasures of historical research - the discovery of a document that might just transform your efforts by providing you with a key that no one has seen before. Darnton writes of his own efforts in this beautiful building where the point of doing the research, not by computer, but by copying out the evidence on 5 x 8 index cards (Darnton asks if you can still find them anymore), which in his delightful phrase, allows you, the researcher, to "marinate" in the facts you have uncovered. We live in the information age. Misleading, says Darnton. Every age is an information age, each in it own way, he writes. "Farge (the author of the book he reviews) shows how information travelled through the media of eighteenth-century Paris. ...the flow of talk and images...shaped a collective consciousness that often erupted in violence." Information has always been "flammable," says Darnton. All information is available online. False, he writes. "According to a well known but unverifiable estimate by one of Google's engineers, 129,864,880 different books exist, and Google has digitized over 20 million of them." That is only about 6.5% of everything in print. The future is digital. Misleading again says Darnton. "To imagine a future in which digital destroys the analog is to misunderstand...the history of communications in general. For journalism, this is a sobering idea. We live in an environment that is so relentlessly and arrogantly digital that the idea that books, pamphlets, document and libraries are still relevant is a shock to the system. Investigative reporting has been a huge beneficiary of digital sourcing. But it still requires a lot of shoe-leather reporting, in much the way that historians do. As Darnton states, the future may be undoubtedly digital. But he hopes it comes with a greater tolerance for analog information, and the willingness of journalists and historians to uncover that information on whatever platform it may be found.